The University of Idaho is facing a sever budget shortfall and will likely have to trim down some of its offered majors. 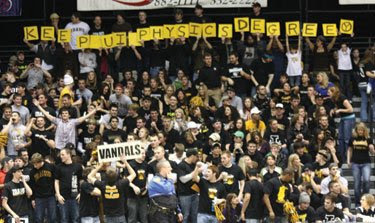 The administration drew up a list of 41 different academic programs that could be axed, and among them is the physics major. Should the cut go through, the Dean of the College of Science Scott Wood said that he wanted the physics department to focus more on research than teaching. University research is important to be sure, but just as important is training the next generation of physicists. The more people out investigating the fundamentals of the universe, the more likely revolutionary discoveries will be made and utilized. Not to mention, I find it hard to imagine that the university would even be able to keep its place as a cutting edge research facility if it doesn't have a physics major to encourage enrollment. Technology is already central to modern society, and is only going to be more integrated into every day life as time goes on. Some of the greatest problems facing the modern world such as energy concerns and the environment need new and cutting edge technology to fix them. This technology needs research and development by the country's best and brightest if we want to stay in the game. The competition around the world for newest technology is fiercer than ever, and if the United States wants to continue to compete, we're going to need all the help we can get. Simply put: The easier it is for people to get degrees in physics, the more physicists there'll be, and the more discoveries can be made. Budgets are tight in universities across the country, and sometime tough choices have to be made. But cutting out the physics program is defiantly a bad idea.